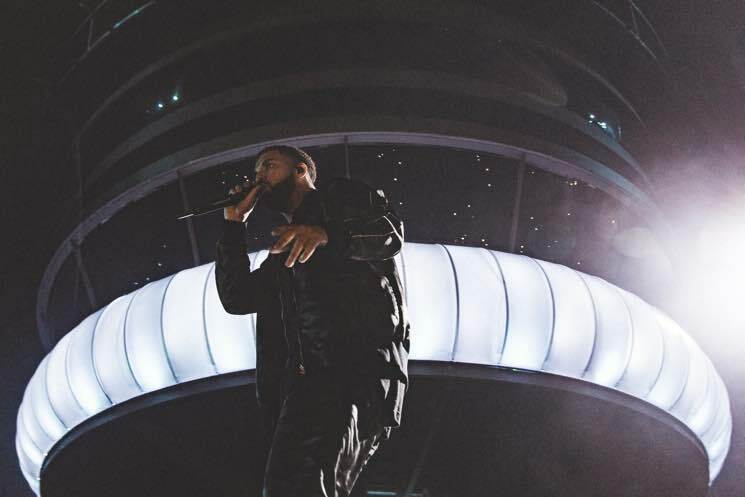 Drake hosted his annual OVO Fest for the eighth year running last night (August 7) in his beloved hometown of Toronto, recreating a massive replica of the CN Tower right on stage in case the crowd had any doubt where he came from. As usual, Drizzy treated those in attendance to a massive list of guest performers, bringing out some of the hottest names in hip-hop right now, as well as some old favourites — and given the sea of phones lighting up the sky, it's hardly surprising that plenty of video footage from the fest has now surfaced online. Rae Sremmurd showed up and got the crowd moving to their massive hit "Black Beatles," leaving very few onlookers in mannequin challenge-style tableau. French Montana also joined the group for "Unforgettable." In one of the biggest surprises of the night, Tory Lanez joined Drizzy on stage, proving that the two Toronto rappers had indeed squashed their beef. They shared the stage for "Controlla." Cardi B was brought out too, delivering "Bodak Yellow." Migos were also on hand, firing up the crowd with C U L T U R E cuts "Bad and Boujee" and "T-Shirt." Travis Scott, meanwhile, was on hand to join Drake and Quavo for "Portland," then "Butterfly Effect" and "Goosebumps." For a major throwback, Nelly hit the Budweiser Stage and rattled off huge hits like "E.I.," "Country Grammar" and "Hot in Herre." The star-studded guest list didn't end there, though. Fellow Torontonian the Weeknd returned to his OVO roots and helped wrap up the evening with cuts like "The Hills," "Starboy" and Take Care collab "Crew Love." Pick up albums by Drake, the Weeknd and Tory Lanez via Umusic.